Ending an era that provided employment based on race, religion or political party, Finance Minister Mangala Samaraweera said measures have been taken to strengthen the economy by providing jobs on merit.Addressing a ceremony to hand over appointment letters to 77 Custom officers of the second grade last week he underscored the important role Sri Lanka Customs play in setting the economy on a strong footing to provide essential services to the general public. “Sri Lanka Customs is one of the key revenue collectors for the country. The three major departments that helps to run this economy include Sri Lanka Customs, Excise Department and Department of Inland Revenue. The free education from grade one till university level and healthcare services are provided thanks to the income we collect from these institutions. So, today you are joining a job for such an economically important place,” he added. 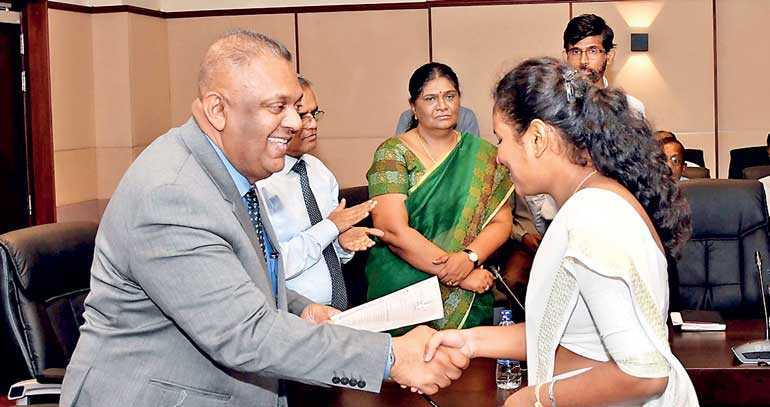 Pointing out that bureaucrats will meet different fairies who speak of illegal ways of earning money, Samaraweera stressed on the implication to overcome such situations. “We have only looked at the skills and talent in giving these appointments. Of the total 7,400 people that applied, you have come to this very day after a very competitive examination and an interview. If in another era, 99% out of 77 of these appointments will get to Matara. Today we have not given our religion, race, area or political party to these appointments,” the Minister emphasised. Finance Ministry Secretary Dr. R.H.S. Samaratunga, Sri Lanka Customs Director General P.S.M. Charles, appointees and their parents were also present at the event held at Finance Ministry Auditorium last Friday (21).